Garuda is a humanoid-bird in Hindu and Buddhist mythology. Garuda is the vahana or vehicle/mount of Lord Vishnu. Garuda is often depicted as having a strong golden body of a man with a white face, red wings, and an eagle’s beak and with a crown on his head. This ancient deity was said to be massive, large enough to block out the sun. Garuda is the enemy of the nagas(serpents). He is an important deity and the Garudopanishad and Garuda-purana are dedicated to him. He is also called Chirada, Gaganeshvara, Kamayusha, Kashyapi, Khageshvara, Nagantaka, Sitanana, Sudhahara, Suparna, Tarkshya, Vainateya, Vishnuratha among others. He is referred to as Syena ,or eagle in the Vedas. He is believed to have brought nectar from heaven to earth. On Garuda’s left wrist is the serpent Adisesha and on his right he wears the serpent Gulika; the serpent Vasuki forms his sacred thread. Takshaka, the cobra forms his belt and the serpent karkotaka is his necklace. Padma and Mahapadma are his ear rings.The snake Shankachuda adorns his divine hair. He wives are Rudraa and Sukirthi. Garuda plays an important role when Krishna and Satyabhama ride on his back to kill Narakasura, a demon. Lord Vishnu rides on Garuda to save his elephant-deveotee,Gajendra. It is believed that Garuda’s wings chant the vedas while flying. Garuda was born out of an egg laid by Vinata, one of the wives of Kashyapa; as per the Vishnu-purana the egg was laid by Diti and not Vinata. Garuda helped Lord Rama in his battle against Ravana. 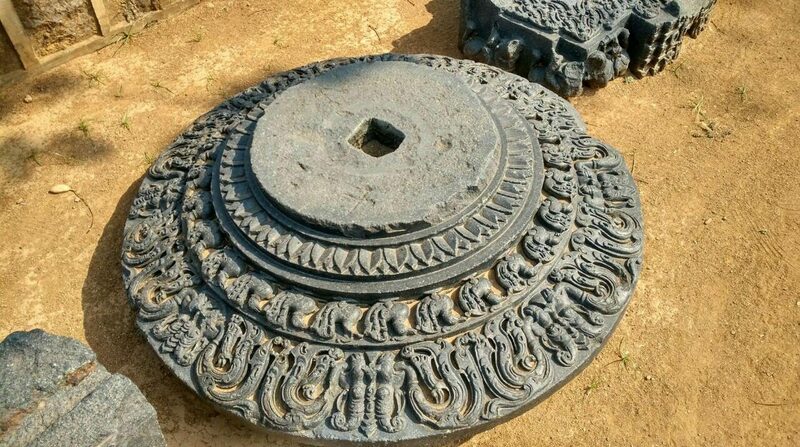 When Lord Rama, Lakshmana and the monkey battalion could not withstand the snake arrows or nagastras of Indrajit, Garuda supplied Garudastras or eagle-arrows. Garuda is considered the king of birds. His sons are Sampati and Jatayu as mentioned in the Ramayana. As per the Mahabaharata Garuda had six sons Sumukha, Suvarna, Subala, Sunaama, Sunethra and Suvarchas from whom descended the race of birds. In Buddhism the Garudas are enormous predatory, intelligent birds with social organisation. Garuda is an important deity across South Asia and is worshipped in many countries. Garuda is in the national emblem of Indonesia. Garuda and naga,sandstone sculpture, 10th century,Tra Kieu, Quang Nam, Museum of Vietnamese History ,Ho Chi Minh City, Vietnam. Vishnu on Garuda, bronze,12th century, Cambodia. Depicted below is Garuda,returning with the pot of amrita, which he had stolen from the Gods in order to free his mother from Kadru, mother of serpents. This entry was posted in Ancient Indian history, art history, asian art, Garuda and tagged Ancient Indian history, asian art, Garuda on January 31, 2017 by historyreads.